Participants attend a BOOST Training on February 12, 2018. Photo Credit: Lara Sidhu. How does the work of the Beloved Community Fund support communities of color in Oakland? Since 2013, Akonadi has awarded $1.8 million through the Beloved Community Fund to over 260 organizations. 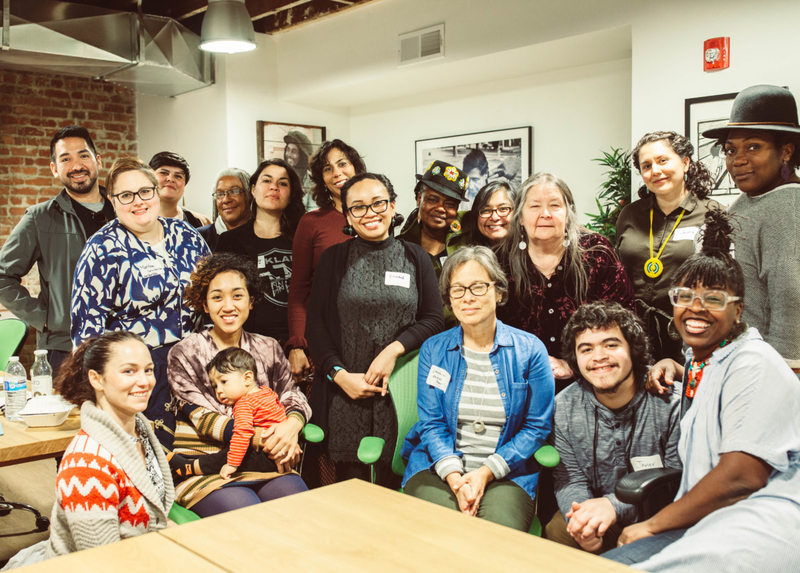 We launched the Beloved Community fund to support Oakland communities who are engaged in cultural work to strengthen movement building for racial justice. With the fund, we prioritize community arts and cultural groups that have historically had limited access to institutional funding. Through the fund, we support events and projects that offer free and accessible cultural experiences rooted in Oakland’s communities of color. We see these projects and events as an opportunity for communities to come together, strengthen their voices, encourage public discourse, share histories, and find common ground. Providing space to celebrate and reflect is a way to build strength and voice through cultural exchange. Oakland communities of color are facing a myriad of challenges: lack of political voice or power, disenfranchisement, challenges with public education, racism, and access to healthy foods. This fund is one way to use arts and culture to address their concerns with these issues and inspire people to dream of what is possible for their communities. What will the BOOST Organizational Strengthening Pilot do and why did you feel it was needed? We saw that many of the organizations we fund were struggling with challenges including access to resources, limited staff capacity, and organizational development needs, although many had been in existence for years, if not decades. The rising cost of living in Oakland threatens the survival of many arts and cultural organizations led by and serving communities of color. For these reasons, we reached out to the Hewlett Foundation’s Performing Arts Program staff to see how could help support these groups that both foundations see as critical to our cultural ecosystem. With support from the Hewlett Foundation, we launched BOOST earlier this year to support under-resourced arts and cultural organizations serving communities of color in Oakland. BOOST aims to provide organizations with technical assistance, capacity building, coaching, and the opportunity to reflect on how to sustain and grow their work. In this pilot, five Oakland-based organizations received a total of $100,000. The full program will run for two years. In addition to critical funding, we also offer deeper support, cohort building, peer learning, and access to organizational development experts. BOOST has been designed to bolster these groups, leading to stronger organizations that will, in turn, strengthen, unify, and cultivate solidarity across our city. The first five grantees in the BOOST program are: BAY-Peace, Intertribal Friendship House, Music is eXtraordinary/Oakland Public Conservatory, Somos Familia and Studio Grand. How do you think about the connection between cultural organizations and racial justice? Cultural organizations are community anchors. Some offer space, others offer creative seasonal programming through festivals, theater, dance, music, and poetry. Others provide support to artists and communities to help launch their artistic visions. With these organizations, there is a social and cultural discourse that allows communities to express their hopes and fears while finding common ground in their stories. There is often a sense of urgency and deep purpose in the cultural and artistic practices, which are connected to the well-being of communities of color. These communities do not often find themselves positively portrayed in mainstream media. They often feel dismissed by mainstream arts organizations and the larger institutions often feel distant from their local communities. Despite these realities, there are rich, deeply intelligent cultural traditions and high-caliber artistic practices happening in these communities—practices which are inextricable from the existence and survival of these communities. Akonadi recognizes that art and culture-making are linked to our survival, on a spiritual and emotional level, and we are working to provide the space that helps us imagine and create the world we want to live in. There are many examples of iconic racial justice-based cultural work that has emerged from Oakland. The artwork of Emory Douglas, The Black Panther Party’s minister of culture, captured the struggle of black people in the United States and became a galvanizing force that allowed black communities to understand the legacy of racism and the connection to their struggle for basic needs and rights. Today, we see organizations such as the Lower Bottom Playaz centering theater performance and discourse for black communities, systems-impacted people, and social service providers in an effort to create deeper support for our communities. The Intertribal Friendship House is another local organization, which was established in 1955, as one of the first urban American Indian community centers in the nation. It is now one of the only centers standing for native people in the Bay Area. It welcomes first nations people from across the globe and maintains programming for people from local and relocated tribes. In a recent report commissioned by Akonadi and the Kenneth Rainin Foundation titled Mapping Small Arts and Culture Organizations of Color in Oakland, we attempted to map the wide breath of cultural organizations based in Oakland. The report captured 138 unique organizations. The report sought to catalogue the existing organizations and understand the specificity of how these organizations sustain cultural work in our communities. In order to capture organizations that were not part of the initial study, we are asking for organizations of with budget sizes of $250,000 and under that are led by and serving communities of color in Oakland to add themselves to the list. 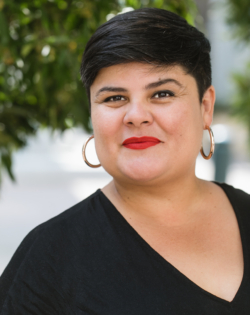 We hope that this study will make visible the tremendous contribution these artists and organizations make in Oakland and across the Bay Area. What motivates you personally to do this work? I believe deeply in the power of cultural work to provoke new ways of thinking, provide solace, and bring communities together. At a young age, I was drawn to my nana’s kitchen table where she would sing old Mexican songs with her friends and my aunties. Those moments always felt so special. It’s when the most joy was felt and when the most stories were shared. Learning the songs allowed me to know Spanish better, giving me back something my American upbringing had started to erode. Throughout my life, arts and cultural work has been central to my understanding of who I am: in middle school when I took theater classes at Plaza de la Raza, an arts center in East Los Angeles, or in my teens and twenties when I was submerged in the local music and theater scenes on the Eastside of L.A., I loved it all. I’m here today because of it. Prior to coming to the Akonadi Foundation, I worked at a small art space in Oakland called Studio Grand, where I learned first-hand the sacrifices and ingenuity it takes to run a cultural space in Oakland. It was hard. But through all of the challenges, I knew it was important to reserve a space for performance, art, and cultural work, especially for communities of color in Oakland. I have a deep affection and concern for the people who work to create and maintain cultural space that feeds the spirits of Oakland’s communities. I’m motivated by being part of the solution, by helping local public and private leaders work together to make sure that Oakland and the Bay Area can be a place for everyone. The displacement of vulnerable communities cannot be seen as a necessary outcome of changes in the Bay Area. Ultimately, I’m motivated by the creativity that emerges from our communities of color. It sheds light on both the precariousness of their position today and the preciousness of their continued presence in Oakland.